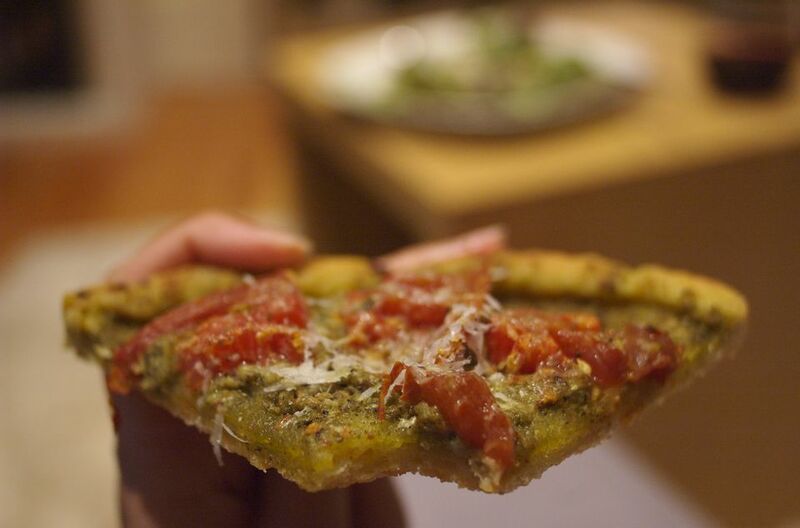 A simple vegan recipe for a homemade pizza dough using cornmeal, yeast, and water. If you've got plenty of cornmeal on hand, making a pizza crust is a great way to use it up. This recipe will make 2 large 18-inch thin-crust or 2 medium 12-inch thick-crust pizzas. Pizza crust recipe courtesy​ of The Wheat Foods Council. In a medium bowl combine water, yeast, sugar, cornmeal and 1 1/4 cups flour; mix thoroughly. Let rest 5 minutes. Place dough in a sealable bowl or plastic bag sprayed with non-stick spray. Let rest 15 minutes. This can be refrigerated all day. Coat pizza pans with cooking spray. Use cast iron skillets, stone deep dish pizza pans, regular pizza pans or cookie sheets. Divide dough in half and pat or roll out to fit pizza pans, forming a slight edge on the dough. Prick holes in the dough and bake for about 8 minutes. Top with your favorite ingredients. Bake 15 to 20 minutes or until crust is browned. Divided into 8 slices, each piece provides approximately 178 calories, 5 grams protein, 35 grams carbohydrates, 1 gram fiber, 2 grams fat (0 g saturated), 0 milligrams cholesterol, 75 micrograms folate, 2 milligrams iron and 351 milligrams of sodium.